Store the bottles on their sides. This prevents the corks from drying out and becoming hard, causing them to lose their pliancy and shrink, to the detriment of wine quality. With the passing of time, wine undergoes a biological aging process. Harmful bacteria and enzymes thrive at high temperatures, and for this reason bottles of wine should be stored in a cool place. The temperature should remain constant because temperature swings can cause tartaric precipitation at low temperatures and precipitation of protein substances when they rise. It has been proven that wines stored at a constant temperature of 4°C remain acceptable for at least two years, those stored at 15°C for 20 months and those at 25°C for 7-9 months. Light can also alter wine. 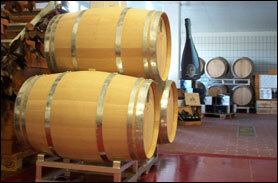 The cellar in which wine is to be stored must not be exposed to strong light. It is for this reason that green, brown or yellow bottles that filter out certain light wave frequencies are normally used. - the bottles should never be dusted, but the cellar must be clean.